It is also the reason I did not post this morning. 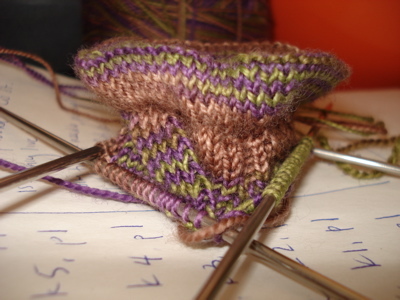 I have at least seven other projects on the needles, included a sock that I am making progress on, so I can’t really explain why I felt the need to cast on — except that I was procrastinating on Ravelry, and saw a gorgeous photo of the January Yarn Pirate Booty Club yarn, Kalamata, en route to becoming Nutkin. In this case, I’m a joiner. Home for lunch — must get back to work! This entry was posted in knitting and tagged booty club, january, kalamata, merino, nutkin, yarn pirate by barefootrooster. Bookmark the permalink.